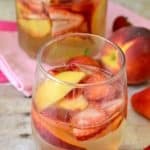 White wine sangria with fresh sliced peaches and strawberries – a beautifully delicious summer drink! There’s something about getting together with good friends and good conversation that just feels so worth it, and no matter how busy my life got, it still felt worth it! We would get together at one of our houses, and all bring something delicious to share, and stay out way too long enjoying one anothers company. And then….just like that….book club started to crumble. People started having kids, and then more kids, and work schedules got busier, and two people moved away, and two others had a falling out…..and suddenly the book club I loved was no more. Sad, right? But here’s the good news. I’m still friends with everyone from book club….and (every now and then, since life is crazy) I still get to see them! In fact, I saw a few of them just last week when we got together to celebrate a birthday. And, just like in book club, we had good food, good company, good conversation, oh – and did I forget to mention? Good wine! We almost ordered a pitcher of peach sangria but stopped ourselves….so in honor of book club and birthdays and the best friends anyone could ask for, I decided to make my own version! Now I just need my book clubbers to share it with! 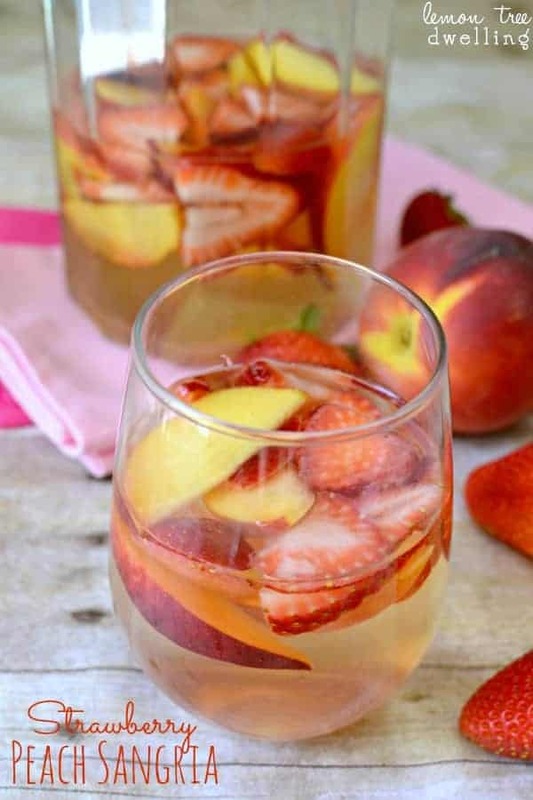 Combine white wine, rum, Peach Schnapps, and strawberry simple syrup in a large pitcher. 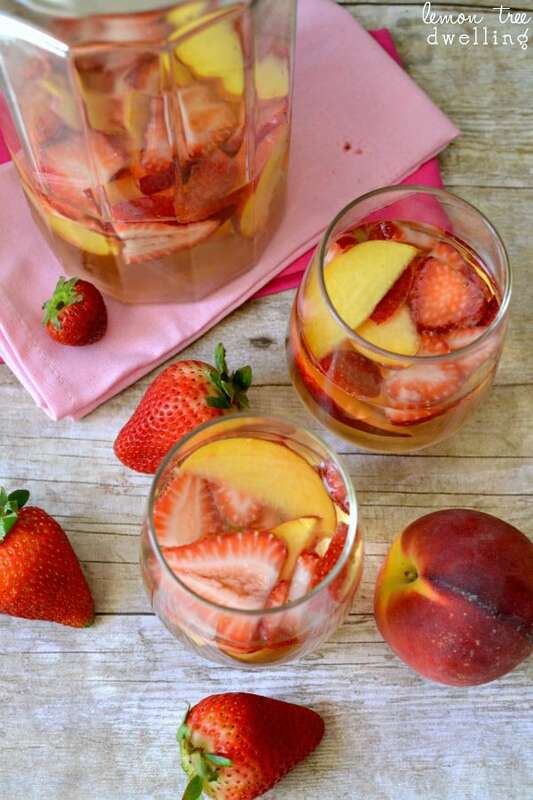 Before serving, add sliced strawberries, sliced peaches, and soda. 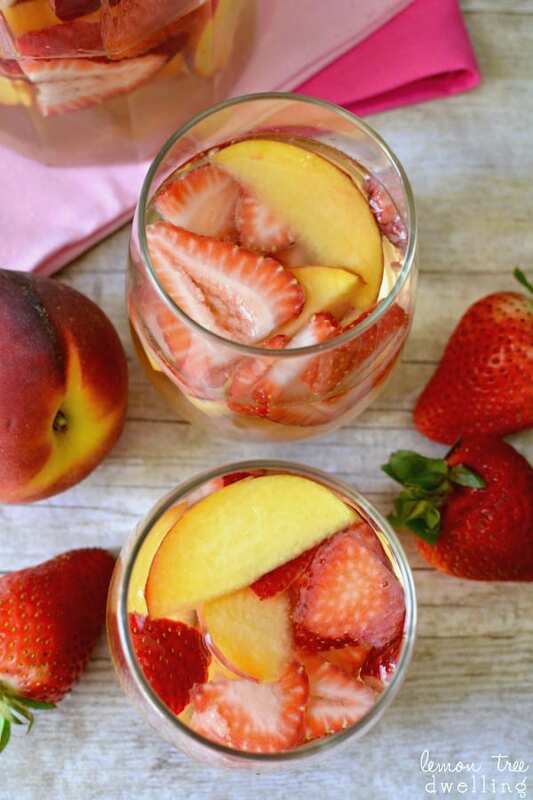 I’ve really been wanting to make a sangria, and this looks amazing, Cathy! 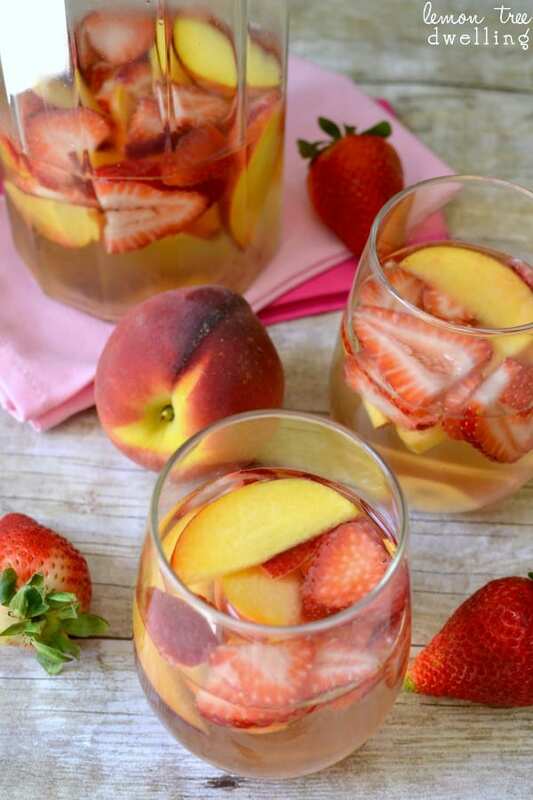 The strawberry peach combination looks wonderful! Awwwww . . . . I’ll be there in five minutes. Pour me a glass! Sangria is the perfect drink to sip on a summer day with friends 🙂 Love these fresh flavors! YUM.. i can never go past a good sangria. definitely could kick back with a glass right about now! 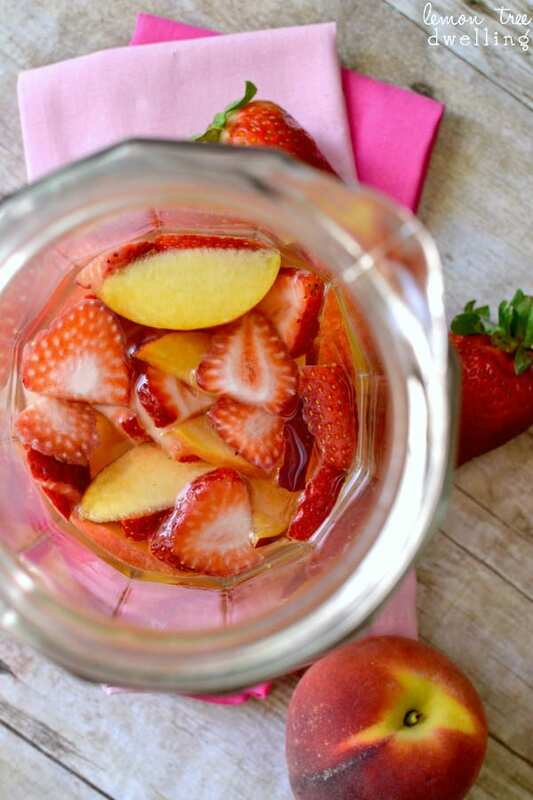 Sangria is one of my absolute favorite summer treats! 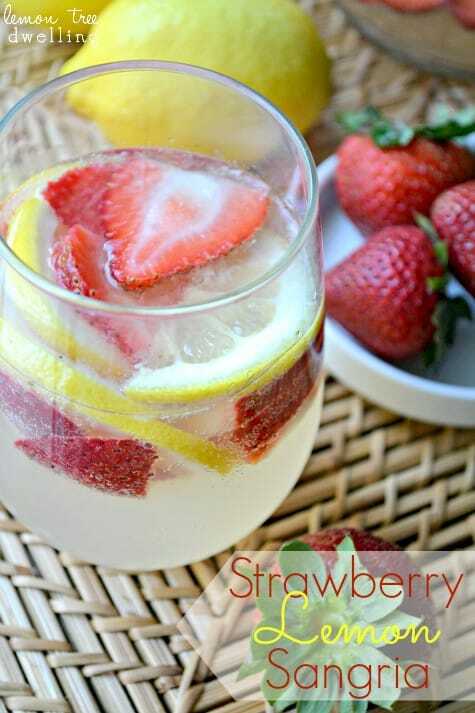 This recipe looks so refreshing and flavorful. I also love that you included your other sangria recipes at the bottom. Thanks! 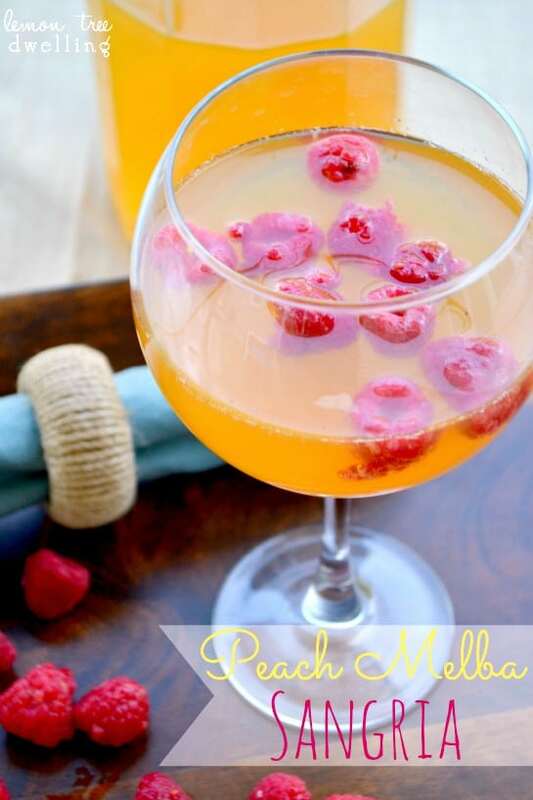 Cathy, this looks so refreshing – would love to be sipping one sitting on my deck! What do you mean by white soda? Like lemon lime soda or a club soda? You could use either, depending on how sweet you like your drinks! Have you used frozen fruit instead of fresh since they aren’t in season yet? Is one better than the other? Yes! 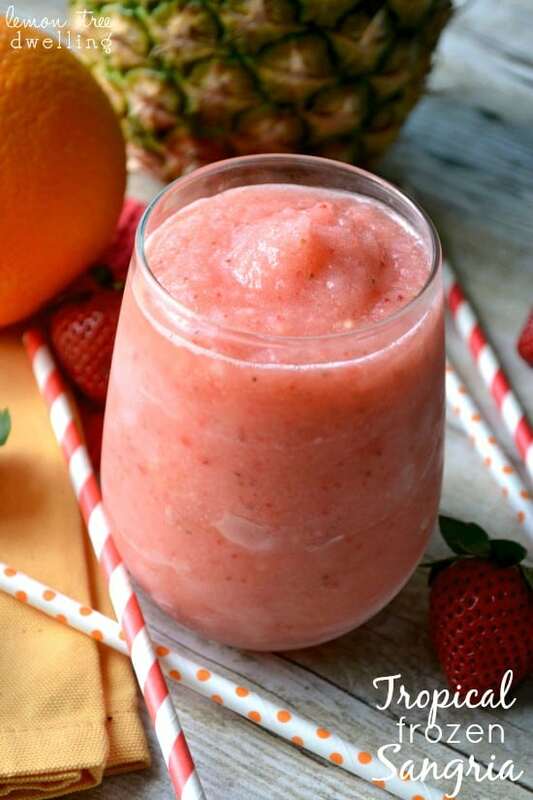 You can absolutely use frozen peaches and/or strawberries without a problem! How many sangrias does this make? 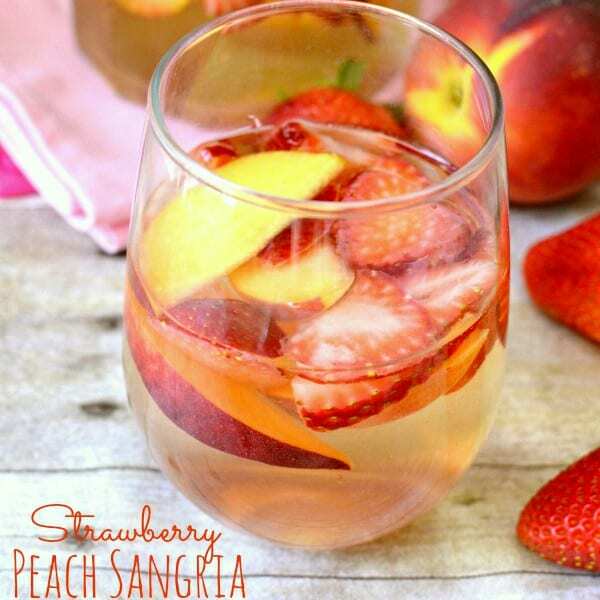 I need to make the strawberry peach sangria for about 25 people. Great recipe! I left out the simple syrup and instead used Sprite for the soda. Turned out plenty sweet and pretty strong! Thanks! A big bottle of white wine, or small bottle? How many servings does this make? I need to make for about 15-20 ppl. Thanks.